How to fix to Thermalite, Durox and other lightweight blocks. Lightweight blocks are often know as aircrete blocks and they require special fixings to make a secure fix. This project shows you how to attach or fix to Termalite and other lightweight blocks and the type of fixings that you should use. Fixing to Thermalite, Durox and other lightweight blocks really requires special fixings which can grab the block from inside the hole you drill. Plugs and fixings that expand as you screw the fixing into the plug tend to break away the inner surface of the hole and become loose in no time at all. Proprietary fixings can be bought in most DIY Stores and they will be labeled, "fixings for lightweight blocks" or "fixings for airated blocks". What are Lightweight or Aircrete Blocks? These are blocks that are used for modern building. They have many characteristics that make them better for building that traditional bricks and blocks. They are light which makes them easier to handle. In some cases they can be larger which makes building faster, as fewer blocks have to be laid. They also have significantly improved insulation properties, which is very important now with building regulations ever improving. 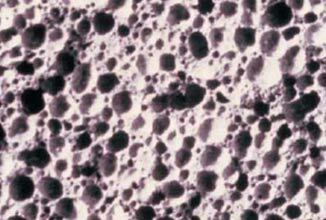 This means that you can reduce the cavity size and still achieve the required thermal properties (U-value). It is very difficult to achieve the required standards in new construction without using these blocks therefore they are very commonly used. Thermalite and other lightweight blocks have a micro-cellular structure which means they contain literally millions of tiny air pockets which make them lightweight but at the same time give them a great compressive strength. Lightweight blocks can also be sawn with a handsaw making bonding a great deal easier and because of their structure are moisture resistant, frost resistant and even fire resistant. They cover pretty much every building regulation and as such are being used in every modern home construction. The only problem with them is that they are not as easy to fix to as the older, more traditional blocks unless you have the correct fixings. 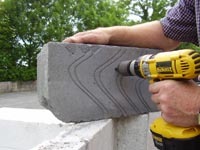 There are a number of fixings that are designed specially for fixing to lightweight or aircrete blocks. 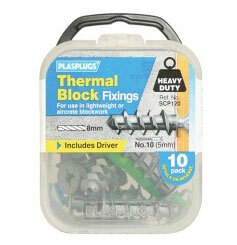 It is worth using these are you will achieve a secure and lasting fixing point to the block wall. 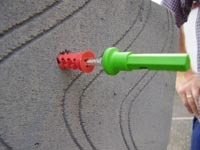 Aircrete blocks tend to be powdery and can crumble easily which means that if you use normal wall plugs and fixings they will not get a secure grip and can be pulled out easily. In our store we have a section dedicated to fixings for aircrete or lightweight blocks, so that you can choose the most appropriate for you, find them here. The procedure is pretty much the same as when fixing to normal concrete or masonry. 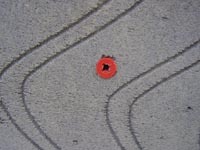 A hole of the diameter stated on the fixing is drilled and the Lightweight block fixing is inserted, but with these they are screwed in, not just pushed in as you can see from the images below. Most lightweight block fixings come with a special tool which allows you to screw the fixing into the block firmly with the help of a battery driver. Drill a hole into the block: the size of the hole will be determined by the fixing. 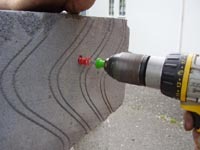 You can use an type of general purpose drill bit to do this as the block is fairly soft. Can I Use Chemical Fixings On Lightweight Blocks? Can I Fill An Old Opening In A Wall With Lightweight Blocks? What Fixing Can I Use On Lightweight Blocks?